In the 1980s, Kraft Foods’ Grey Poupon formed an indelible image in our minds with its TV commercial set in the English countryside featuring one distinguished gentleman in a Rolls-Royce politely asking another for a jar of Grey Poupon. The commercial’s aspirational tone sparked a plethora of high-end condiment competitors, yet Grey Poupon has maintained its upscale image and popularity over the decades with a remarkable 97 percent awareness level among consumers. In an effort to introduce the mustard brand to a younger audience, Kraft is revisiting the popular theme through its new Grey Poupon Facebook page entitled, “The Society of Good Taste.” DirectMarketingNews.com recently reported on how Kraft is giving a social media spin to a classic campaign. Candidates’ personal pages are thoroughly evaluated through a special algorithm that gives heavier significance to an applicant’s more high-minded pursuits, such as top-rated universities and upscale interests. It also checks for proper grammar and good manners. While a certain percentage of members are granted membership, some are denied, yet they are eligible to apply again and their persistence usually pays off. 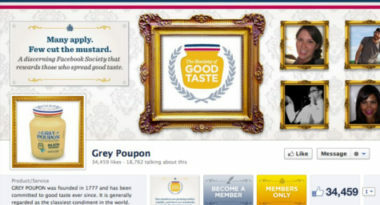 While most brands focus on getting more ‘likes’ to prove their popularity, the use of such a selective approach in its social media marketing enables Grey Poupon to stand out amidst the all-inclusive tone of other social media pages while conveying the brand’s essence of exclusivity in a fun and memorable way. By carefully choosing its Facebook page members, the brand believes that it will instill a stronger sense of advocacy and greater loyalty among these fortunate few who will go far in influencing a new generation. To incorporate Facebook into your social media marketing strategy, contact MDG Advertising today at 561-338-7797 or visit mdgadvertising.com. MDG Advertising, a full-service Florida advertising firm with offices in Boca Raton and New York, NY, specializes in developing targeted Internet marketing solutions, exceptional creative executions and solid branding and media buying strategies that give clients a competitive advantage. Our core capabilities include branding, logo design, creative, online advertising, print advertising, media planning and buying, TV and radio, web design and development, email marketing, social media marketing, and SEO.